There was no shortage of destination news at a recent Las Vegas tourism mission stop, called “Feed Your Imagination,” in downtown Vancouver. A group of hotel and attraction suppliers were led by Vegas tourism officials from the Las Vegas Convention and Visitors Authority in describing developments in one of the world’s biggest tourism meccas. They set up shop on the conference level of the Parq Vancouver, where they took the opportunity to relate the latest tourism happenings to local travel agents and tour operators. For instance, Raider Nation is moving from Oakland CA to Las Vegas NV, bringing an NFL team to Las Vegas for the first time, along with a stylish new stadium that is located in close proximity to the Las Vegas Strip. The Las Vegas Raiders will kick off for the first time in the fall of 2020, and in doing so will debut Las Vegas Stadium. It is located on about 25 hectares west of the Mandalay Bay Resort, just west of Interstate 15, and an easy drive from the airport. It will have a glass-domed roof, retractable doors, a natural grass playing field and comfortable climate. Construction is expected to finish in August 2020, in time for the inaugural season of play by the Las Vegas Raiders. North from there, located on the Strip itself (Las Vegas Blvd.) is another gigantic construction site, called Resorts World Las Vegas. This mega resort is the Strip’s first ground-up, major casino resort development in a decade. It will be built with a modern Asian theme, comprising 3,400 rooms and towers that will reach 60 storeys in height. RWLV is located on a 35-hectare site, diagonally across from Wynn’s Encore tower, and within walking distance to the Las Vegas Convention Center and Fashion Show Mall. It is targeting a late 2020 opening. The nearby Las Vegas Convention Center is also in the midst of a massive expansion project. This will add 130,000 sq. metres to the current convention center facility, including at least 56,000 square metres of new, leasable exhibit space. The expansion is slated for completion in time to welcome the Consumer Electronics Show in 2021. The following phase of work will be the complete renovation of the existing Convention Center facility. That has a projected completion date of 2023. 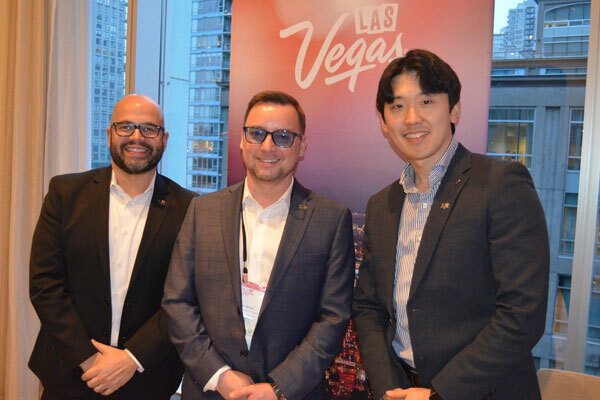 Reps from the Las Vegas Convention and Visitors Authority at the recent “Feed Your Imagination” event in Vancouver included (l-r) Fernando Hertado, senior director of global sales; Blair Hirtle, account manager for Western Canada and David Han, senior account manager for Canada.